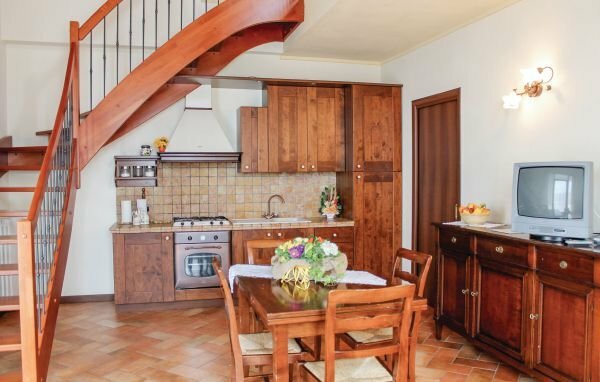 Charming country house with swimming pool (6 apartments in total, see also IEC102), nestled in the beautiful Emilian hills and only 3 km from the famous thermal baths of Salsomaggiore. The accommodation is situated on the ground floor, has a separate entrance with beautiful porch for outdoor dining and with stunning views of the countryside. Available for all guests: spacious green areas for sunbathing and a swimming pool. The location is ideal for exploring the area and its typical products such as parmesan cheese, charcuteries and wine. History of art lovers will find about 3 km away "the route of the castles of the Duchy" with the ancient castle Scipione (from the 11th century), where frescoes and furnishings from the 17th century are well preserved. From the house several hiking trails lead to the Via Francigena, and less than 2 km away is the nature park Storione, ideal for bird-watching. On request: 1 extra bed or a baby bed, included in the price. Only 32 km away is the town of Parma, the city of music and of theater and with the birthplace and museum Arturo Toscanini, the "Casa del Suono" and last but not least the Teatro Regio, which was built at the request of the Empress Maria Luigia and inaugurated in 1829 and which is still one of the most famous theaters in the world. In the internal restaurant guests can enjoy local dishes ( open Saturday night/ Sunday at noon) The restaurant is used for weddings. The last 200 meters of the paved access road are partly bumpy. Pool open: medio May-end Sept.
Be the first one to tell us about your rental experience while staying at Rosa. Let us know if the listing matched your expectations. You can share your comments about the location, property owner/manager and all the unique features that made your stay a memorable one.